Are you a tea drinker? I drink a lot of tea. Hot in the winter and iced tea in warmer weather. While today’s post is about green tea, I make my tea using my own blend of green tea, black/orange pekoe, and white teas. It tastes absolutely delicious and is super healthy for you. Green tea, has no caffiene, and has been around for a long time and is better known in other countries as a healthy and healing tea. It probably has the most health benefits of any kind of beverage or food item we know about. Green tea was developed centuries ago for the sole purpose of healing. The Chinese are the ones who first realized the benefits it holds and found a way to harness them for consumption. Green tea became an integral part of their society and culture because it could be used for things like headache pain and depression. It was considered a highly sought after medicinal treatment because they felt it was the wonder drug of their time. This wonder drug has been in their culture for over 4,000 years now. Green tea can be helpful for many disorders and diseases. Some of those include cardiovascular disease and high cholesterol levels, different types of infections, rheumatoid arthritis and even some types of cancer. Green tea is most known for its ability to help your body stay strong and fight off disease – including some forms of cancer, such as esophageal cancer. 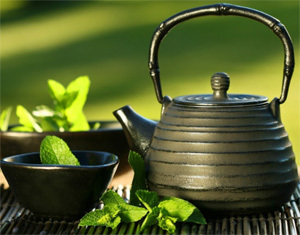 Studies have shown that green tea reduced the risk of esophageal cancer in Chinese men and women by at least 60%. Dieters can also benefit from this flavorful tea. It’s known for its ability to help your body burn off some of the daily calories you take in. It provides you with some of the needed nutrients as well as being a healthy beverage that tastes good. Another benefit you may not realize that it provides is the fact that it can help prevent tooth decay. Since it has bacteria-destroying abilities, it prevents harmful bacteria from settling into your mouth and causing the rotting and decaying of your teeth. That bacterium is also prevented from traveling any further into your body (such as your blood stream) and causing more health problems. If you suffer from insomnia, you should consider drinking some green tea before retiring for bed each night. You can get a good night’s sleep just by sipping a steaming cup of green tea before bed. Introduce it into your daily beverage options and see how its powerful ingredient affects your health and wellness. WOW, I didn’t realize all the benefits from Green Tea. I am a iced tea lover. Maybe it’s time to switch to green tea and reap the benefits! Thanks for sharing Deb!